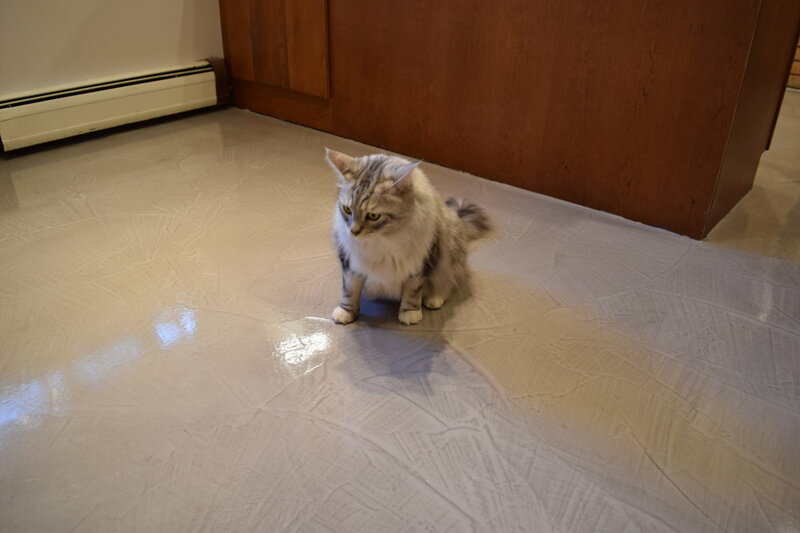 One of our previous customer’s prize-winning, pure bred cats is surveying, and appears to be captivated by, the new decorative cement overlay we installed in her owner’s kitchen. Depending on the research you look at, two-thirds to three quarters of U.S. households have pets. Although this figure is a little less in more “urban” states, like Michigan and Illinois, where only about 55% of homes have pets, this means that for a majority of homeowners, flooring that is compatible with their cats and dogs, and their lifestyles, can be a huge issue and daily concern. Flooring, especially in high activity areas, has not only to be aesthetically appealing and comfortable, but durable, easy to clean, and resistant to stains and odors. Americans already spend lavishly on their pets for food, medication, grooming aids, toys, beds, trackers, vet services, and pet sitters, and they do not want and really cannot afford to spend even more on the repair or replacement of flooring that may have been ruined by pet “accidents”, clawing and scratching, or accumulation of hair and dander. The problem is there truly aren’t many flooring options that capture and bestow the above pet-friendly benefits. Every manufacturer and salesperson may like to claim their flooring is pet-friendly, and a simple search on Google will turn up pages and pages of results attesting to this, but can almost every type of flooring really be considered “pet-friendly”? Carpet and hardwood, with all the nooks crannies, cavities and seams, are inherently prone to permanent stains and odors from pet accidents. Another trendy flooring choice, luxury vinyl tile (LVT), with its thin protective film, and repetitive seams, is also susceptible to odors, as well as dulling and discoloration of its surface. Most leading flooring manufacturers, such as Mohawk, Shaw, and Armstrong, are ever coming out with new, “pet-friendly” technologies, treatments, and warranties, but these are all add-on features, or upgrades, and they cost more money. Another customer went a step further, and had a custom entrance installed for their cats, from the acid-stained basement concrete floor to the litter box area. Does it get any more pet-friendly?! Some flooring options, like natural stone, ceramic and porcelain tile, do stand up to pet lifestyles and activity a little bit better than others, but they also have drawbacks. For example, these flooring types, despite being relatively expensive, all have grout patterns that easily and eventually stain, discolor and slowly disintegrate. In addition, their hard, uneven, and cold-to-the-touch surfaces can be uncomfortable for pets to lie down on. Lastly, the high end, natural look finishes inherent to these flooring types are particularly prone to scratching easily. Decorative concrete flooring, on the other hand, and acid-stained concrete, specifically, does stands up hardily, and handily, to all of the above-mentioned, pet-related wear, tear, and abuse. It is not only one of the nicest looking, and most durable, flooring options available, but in our estimation, it is the only flooring option, in today’s marketplace, that can truly be deemed “pet friendly”. This is because acid-stained concrete, with its unique composition, hallmarked by a continuous, uninterrupted surface, and clear, durable, chemical-resistant, protective sealer, offers no place for pet “leavings” to hide, accumulate, or absorb into. Instead any “accidents” can be easily seen, and rest harmlessly on the surface until they can be cleaned up and disposed of. The sealer on acid-stained concrete, in most cases, is completely unaffected because of the floor finish or wax layer applied on top of it for maintenance purposes. This same dynamic also prevents the surface finish of acid-stained concrete from being gouged, or scratched. Sealers for acid-stained concrete are thick, dense, and hard, making it very difficult for the untrimmed claws of even the heaviest dogs, and most active cats, to penetrate or do any damage at all. In addition, the slip-resistant aggregate, such as glass bead, added to the sealers during application make the surface skid free and safe, while the “thermal mass” property of concrete (mentioned in greater detail in the energy savings section) helps keep acid-stained concrete warm in the wintertime, and cool in the summertime, so pets can sleep or lie comfortably in the sun whenever and wherever they wish.